I believe you can nip buyer's remorse in the bud if you have a professionally written and designed user manual. There is nothing worse than paying top dollar for a product and getting a second- or third-rate manual. We've all suffered through manuals with 6-point type, crowded layouts, and unclear writing. On the other hand, these B2B instruction manuals were so popular that they were frequently used as sales tools and in the client's sales presentations. 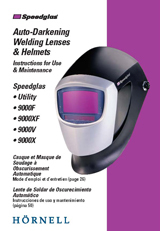 Challenge: originally adapted from a European text, this manual had to be completely overhauled to address the liability concerns of the American market for industrial safety equipment. It also had to be very clear, since busy distributors may not have time to demonstrate this safety product to the buyer. Finally, I supervised its translation into (Canadian) French and (Mexican) Spanish. Challenge: this system — or its predecessor, the Speedglas Fresh-air — were often the first powered air purifying respirator ever used by a welder. 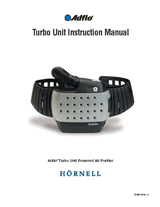 The manual needed to walk the first-time user through the entire process of assembly, donning, and operation. Naturally, it also needed very clear warnings and the obligatory, carefully-worded disclaimers.